With just two weeks to go before the start of a new year, attention is again focused on the fireworks industry. 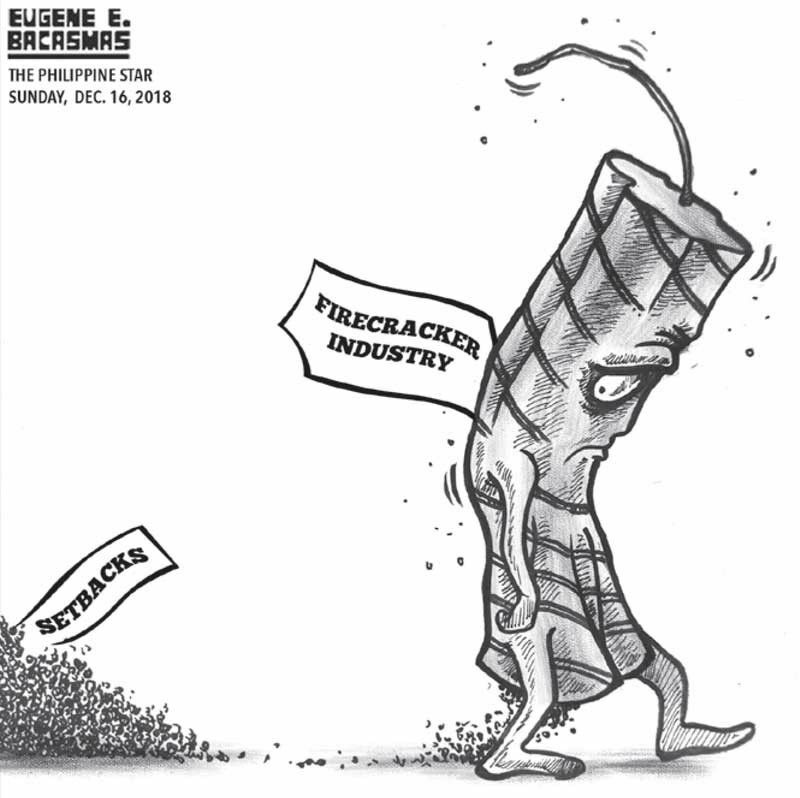 A law regulates the industry, which is a top provider of livelihood and employment in several provinces particularly Bulacan, the country’s fireworks capital. Over the years the industry has suffered a series of setbacks. Consumers have turned to a flood of imports with better quality even if pricier. Poor quality control in local fireworks manufacturing as well as weak enforcement of prohibitions on powerful firecrackers have led to serious injuries and even death, either from explosions or from tetanus. This has made consumers shun fireworks and led to several local government units banning partly or completely the use of the products. Only tradition keeps the industry afloat these days. But even the tradition is dying among younger generations more used to enjoying fireworks displays in common areas rather than in their own households. Leading industry players acknowledge the shifting winds in their business and have made an effort to produce better, safer products. With quality control, they can even become exporters. Many countries continue to celebrate with fireworks. Local government and police personnel must match this with greater effort to stop the manufacture and sale of banned firecrackers. Most of the prohibited items are made in unregistered backyard operations where even children are employed and exposed to conditions hazardous to health. Industry players say their earnings have steadily gone down in the past years. They may never see a return of the fireworks consumption patterns of the past. But the industry can still be saved, if they follow a basic rule in business: reform or perish.